"Manila took a long time to make. What is now its ground used to be sea. The sea reached as far as the present towns of Mandaluyong (‘a place of waves’) and Makati (‘a place of tides’). No one knows how long it took to turn sea into land. But we do know who built a site for Manila. 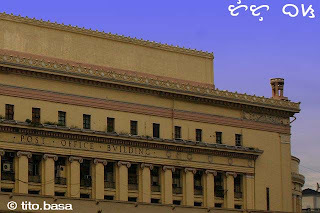 The builder was the Pasig River." Such were the words National Artist for Literature Nick Joaquin wrote in his book Manila, My Manila. It was, and is, the Pasig river who built, and continuously building, Manila. 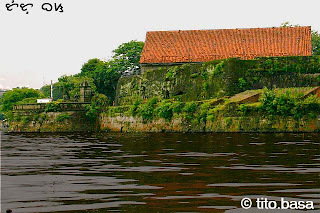 Technically a tidal estuary, the direction of flow is determined by the water level difference between Laguna de Bay and Manila bay. I happened to read a posting in one of my yahoogroups I'm lurking in about the Ayala Museum-Pasig River Rehabilitation Council sponsored Historic Tour of the Pasig River as part of their Ode to the Pasig River painting exhibit at the Ayala Museum I blogged about here plus the post about the upcoming Pasig River Ferry system Pasig River Ferry terminals and schedules. Sensing the urgency and limited slots available for the tour, I made a quick call to the posted number and reserved me a seat and paid promptly since Ayala Museum is very near my place. 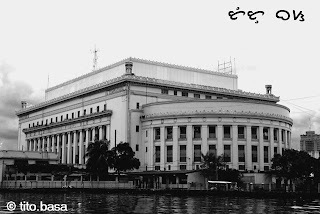 On the day of the cruise, the organizers and participants met up at the Ayala Museum then boarded vans that took us to Isla de Convalencia occupied by Hospicio de San Jose where a ferry is waiting for us to cruise the historic river who built Manila. The Tour, with about 20 people, including media people and a Coast guard personnel, was enlivened by Prof. Ambeth Ocampo, the current chair of the National Historical Commission, with his authoritative information spiced up with historical gossips and trivia. 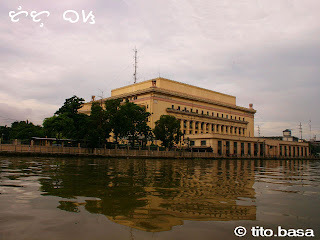 I was in Manila and managed to see Pasig River ... Damn, I seriously am missing Pinas. Wonderful! Can't wait for the next installment. how much is the tour and until when would it be? I've lived in both Pandacan and Pasig for quite a while but I've never really learned about the history of the Pasig river. This is a really interesting tour. Sana ma develop nila, mas maganda pa to kesa sa river cruise dun sa Singapore eh. Great Post. Great great post. The Pasig Ferry Service is back again and it's aircon.